Recently I posted about my concerns about a proposed amendment to the Tasmanian Anti-Discrimination Act (Anti-Discrimination Change Requires More Scrutiny). This amendment, ostensibly designed to control bullying, appears to go much further and potentially have a major impact on various forms of political speech in Tasmania. I've now seen the Hansard transcript of the debate in which Elise Archer (Liberal, Denison), Michael Ferguson (Liberal, Bass), Brian Wightman (Labor, Bass) and briefly Kim Booth (Green, Bass) spoke (the amendment passed on party lines), and I've posted all the relevant excerpts up on Google Docs for anyone interested. It's notable that Ms Archer not only raised the same concern I raised about the lack of a proper free-speech exemption for the new Section 17, but also quoted from a long letter by the Hobart Community Legal Service Inc raising many concerns about the proposed change. I'm going to make some comments about my view of your speech and what I think it says about your political views, and then at the end I'm going to ask you a question. And I'll ask it now too: if your amendment is passed by the Legislative Council, will this open letter still be legal? I ask this because nothing you have said so far has reassured me that it will be. But I think that everything I say in it consists of the sorts of things that people should be allowed to say - and that it should be totally clear that people will be allowed to say. It isn't. Of course, I agree that the amendment, if passed by the LegCo, does not simply ban all communication someone finds offensive, and some of the criticisms may have overestimated the impact in this regard. A person must be offended, humiliated, intimidated, insulted or ridiculed on the basis of their political or religious views or some other attribute, and it must be the case that a "reasonable person" "would have anticipated that the other person would be offended, humiliated, intimidated, insulted or ridiculed." 1. This article presents an analysis of voting patterns in the Legislative Council (the upper house of Tasmanian Parliament) based on contested divisions since the last Lower House election in 2010. 2. This article confirms that voting on such issues in the Legislative Council is quite independent, individual and often unpredictable. Clusters of members with similar views are few and relatively weak. 3. Despite this, the Legislative Council has a "conservative" lean with all members bar possibly one voting to the right of the sole Labor MLC, Craig Farrell. 4. Furthermore, six members of the Council have occupied positions to the right of the sole Liberal MLC, Vanessa Goodwin. 5. 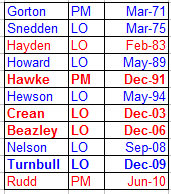 Ivan Dean has been the most "conservative" MLC during this period, with either Farrell or Rob Valentine (very limited data available for Valentine) at the other end of the scale. 6. The voting pattern on contentious issues alone is not a fair reflection of the full behaviour of the Council. Nonetheless it shows that the LegCo can be expected to, from time to time, behave very conservatively on major issues. "Where democracy on the floor really works is the LegCo where the outcome on any issue is always unknown. The fact that the back room deals occasionally fail on the floor of the LegCo should have democrats applauding. Instead there are perpetual calls to abandon it because some don’t like the decisions! Can’t have cake and eat it!! How about analysing the number of times the LegCo supports the government and opposition’s position and determine whether the LegCo is really the house of obstruction as claimed." After that, I just couldn't resist having a look at voting patterns in the Legislative Council, to see what it tells us about the orientation of the Council, whether voting there on contentious votes is predictable, and how "independent" the house of review actually is. I will note though that the last part of Mulder's assignment didn't greatly interest me, partly because it would actually take a lot of work to match up all the bills, but mainly because I think it's well known that the LegCo only rarely blocks legislation that passes the House. Even in the current situation, in which there is a minority government in the Lower House which is facing heavy defeat in 2014 based on current polling and which is often argued to lack a mandate because of the circumstances of its formation, the number of bills that are outright knocked back (as opposed to amended) is not great. The LegCo has a strategic balancing act to play: it has great power, but it has to use it cautiously. Too-frequent use of that power to veto government bills would lead to widespread criticism of members as closet Liberals, greater public concern about just how powerful the LegCo is, and a greater risk of election defeat for incumbents. What I've decided to look at, therefore, is the voting patterns on the floor of the LegCo on those motions that are sufficiently divisive that a division is required and the results of a vote recorded. Again I've used the Parliament of Tasmania Hansard search engine, and I'm only looking at contested votes since the state Lower House election in 2010 created a Labor-Green coalition government. 2. The remaining Legislative Councillors to vote against (Paul Harriss, Jim Wilkinson and Greg Hall) did not indicate an explicit view for or against federal marriage equality, but expressed reservations about the concept of state-based legislation and/or its delivery. 3. The defeat of the bill cannot therefore be interpreted as a rejection of the concept of marriage equality by the Upper House, and represents only the rejection of a given state-based proposal. 4. Every MLC arguing against the bill argued that it was a federal issue, and every MLC arguing against the concept generally supported the idea of marriage as being only between a man and a woman. 5. Other common arguments against the bill included the risks, success chances and costs of a High Court challenge, the bill being a second-rate version of the concept, that the bill would not end discrimination, and that the State Government lacked a mandate. 6. Some MLCs voting against the bill made extremely unsound arguments about public opinion. This suggests a need for politicians to be better briefed on how to (and especially how not to) understand and measure public opinion. Tasmanian pollster EMRS has released its quarterly poll of state voting intentions, available here. (PDF Download). They have also, very nicely, put up a trend graph since the last election here. The trend graph shows that following the formation of a Labor-Green coalition after the March 2010 state election produced a 10-10-5 result, there was soon a blowout in favour of the Liberals, who have been in a majority-winning position since at least the start of 2011. (Typically a major party with a statewide lead of more than a quota (c. 16.7%) over the other should be expected to win a majority no matter what the Green vote; winning with a lead of 12% is quite often possible if the Green vote is low.) Note that since the EMRS figure historically favours the Greens but underrepresents Labor, on all data points on that graph the Green figure should be assumed to be a bit high (typically by 3-4 points) and the Labor figure a bit low by a similar amount. EMRS polls must always be treated with some degree of caution because the company traditionally polls notoriously high undecided rates, and also because there has been a report that in one instance last year the pollster asked other questions before voting intention, a practice that can lead to skewed results. However, I have not yet had further reports of the latter practice, and these latest results are broadly consistent both with a recent ReachTel poll (albeit, one commissioned by the Liberals) and furthermore with another recent internal poll that I have seen that has no whiff of potential pro-Liberal bias. I have no reason to doubt that the picture painted by EMRS is broadly reliable. The headline figures show the Liberals on 55 points (up 6 since August 2012), Labor on 27 (steady) and the Greens on 15 points (down 7). Both the rise in the Liberal vote and the fall in the Green vote are statistically significant by some margin. The Liberal vote is at its equal highest level since the suspect poll in August 2011 and the Green vote is at its lowest in this term. The gap between Liberal and Labor, 28 points, is at its third highest level, and almost back to the levels of August 2011 (33) and November 2011 (31). The figures including those who are undecided but leaning to a party are Liberal 46, Labor 23, Green 13, Independent 2. 1. Recent polling on voter views of the importance of a list of issues, and which parties are best trusted on those issues, shows that many voters regard a range of parties as having policy strengths in different areas, rather than assuming their preferred party is always right. 2. Party trust scores, when weighted by the perceived importance of issues, produce surprisingly accurate predictions of party vote share over the last two and a half years. 3. The Greens' current mediocre polling position, especially compared to before the 2010 election, is probably connected with the party neither "owning" key issues as strongly as it used to, nor being able to convince voters that those issues are important. 1. In Tasmania's current Labor-Green coalition-governed Parliament, votes on the floor of the Parliament in which the Greens vote with the Liberals are rare. 2. The most common voting pattern by far is that Labor and the Greens vote on one side and the Liberals on the other. 3. Yet this was the least common voting pattern by far under Labor majority rule between 2002 and 2010. 4. The pattern in the current parliament is also very different to the previous minority government situation in the state. 5. The formation of a formal coalition between Labor and the Greens appears to have assisted in reducing the proportion of times that the parties disagree with each other, and especially the chance of Labor-introduced legislation being voted down. This has apparently increased the stability of the minority parliament. 6. However this has come at the cost of both the transparency lauded by advocates of minority government and its genuine "Laborness" as understood in the Tasmanian context. 7. The view that the major parties are "Laborials" and agree on nearly everything with the Greens as the real "opposition" is not consistent with any data about voting on the floor of parliament. This was an example of what was supposed to happen in the Tasmanian hung parliament, according to defenders of minority government: a transparent display of the party positions of all three parties on the floor of the House, with the outcome determined by agreement of two of the parties. (Though in this case, it was a strange variant even of that, with the Liberals effectively supporting the Greens' policy so they could continue pushing for more than Labor's). But in the current Tasmanian parliament, which features a Labor-Green coalition, it has been one of very few examples of exceptions that prove the rule. 1. The view has been advanced that since Julia Gillard has become much less unpopular, then so can Tony Abbott. 2. This view does not automatically follow, because Gillard and Abbott occupy different positions and became unpopular for mostly different reasons. 3. The record since the late 1960s shows that the average recovery in net satisfaction for both Prime Ministers and Opposition Leaders between their worst rating and the next election is about 20 points. 4. However, very unpopular Opposition Leaders are usually removed, and those who make it to elections have so far lost them even if they had ceased to be unpopular by election time. 6. However, the general historical trend is against the likelihood of Tony Abbott recovering to a positive or even near-zero rating before the next election. 1. Polling figures released by two pollsters on Monday show Tony Abbott with the worst personal ratings of his career and among the worst of any federal Opposition Leader in Australian polling history. 2. Mainstream media have thus far failed to describe the Abbott leadership as "embattled", a word considered to have great power in describing a struggling political leadership. 3. Abbott is an "embattled" leader by definition, irrespective of his party holding a slender and apparently fast-diminishing lead over Labor and irrespective of whether or not he faces an imminent challenge. 4. The term "embattled" has been quite liberally used for most other leaders who have been in difficulty by comparison. 1. A proposed amendment to Section 17 of the Tasmanian Anti-Discrimination Act, designed to address bullying, is flawed by appearing to carry unintended consequences for political speech and lacking appropriate, explicit and prominently-debated exemptions in this area. 2. The proposed amendment should not be passed by either House of Parliament in its present form. Skimming the Sunday Tasmanian, which I buy mainly for the TV guide, I came across a piece on pp. 74-5 (sigh) by Simon Breheny. (This is now online here.) The piece argued that proposed changes to the Anti-Discrimination Act will curtail free speech in Tasmania, mainly by greatly extending the grounds on which it is an offense to "offend, humiliate, intimidate, insult or ridicule" someone. This piece had many signs of something I should not expect to take too seriously. It was headlined "Attacks on free speech" (the sort of headline that usually indicates simplistic and invalid tabloid melodrama.) It was written by a law-student "lobbyist" for the Institute of Public Affairs (a self-described "free-market think-tank" with a dubious historic form guide), and worst of all it tried to curry sympathy for Andrew Bolt. NOTE: This is an old article that has had various minor data updates and a short postscript added in May 2013. The basic conclusions are not affected. 1. Recent election and polling results show the Australian Greens are clearly struggling. 2. Furthermore, the new leader, Senator Christine Milne, has polled poor personal approval figures. 3. Attempts to connect the slump in Green fortunes with leadership transition are inconclusive for many reasons. 4. Nonetheless, the change of leadership has at least not stopped a flow of votes from the Greens back to Labor. 5. The current situation is consistent with Milne's track record as a poor electoral performer when leader of the Tasmanian Greens in the 1990s. UPDATE 4 pm: Nothing has changed with only Virginia and Florida genuinely close and this is looking like it will be a triumph for state-polling-based models for the second election in a row. UPDATE 2:40 pm: At present only Virginia and Florida counts are looking really close (as well as NC where Obama has done better than expected but still looks like falling just short). Even if Romney wins all this he still falls short so there is no sign at present of a path for him to victory. UPDATE 1:40 pm: Obama has in my view won Ohio based on similar methods to those used to model Australian counts in progress. Apparently, some 8% of this site's readership so far is US-based, ten times more than any other non-Australian country to this stage. That inspires me to say a few quick things about the massive logistic exercise unfolding over there at the moment and the debates about what will very soon happen. For those who are not familiar with the US system, making sense of the endless history-laden data-drenched arguments about how to predict who will be President can be a daunting task. Hopefully the following comments will be useful in informing people about some of the pitfalls when it comes to what to take seriously. No we're not talking catwalk stuff here, but these things are certainly overdressed and each particular one will go out of fashion very quickly. When you see someone claiming to have found a model that predicts a certain candidate will win based on a shopping list of items that have supposedly "predicted" (despite being made after) every presidential election since the year dot, run for the hills. The chief offender I noticed this time was the Uni of Colorado study that claimed that Romney would win, but there were plenty of equally shoddy examples calling it for Obama. Summary: The idea of a "killing season" for political leadership changes in late November - early December is real with a heightened risk of dismissals at federal and state level. However, only about a quarter of leadership removals occur in this period. There is a lot of talk at present about the melodramatically so-called "killing season", the time during the last week of November or early December in which struggling party leaders have good reason to be nervous. The theory is that this is the last opportunity to clear the decks before the parliament breaks for summer, and start the year on a new footing. But how much evidence is there that it is real? The following list shows federal leadership bootings since 1970. Those shown in bold occurred in December, mostly early December. So with 4 out of 11 bootings happening in this period there is some evidence that it is a time of increased danger.